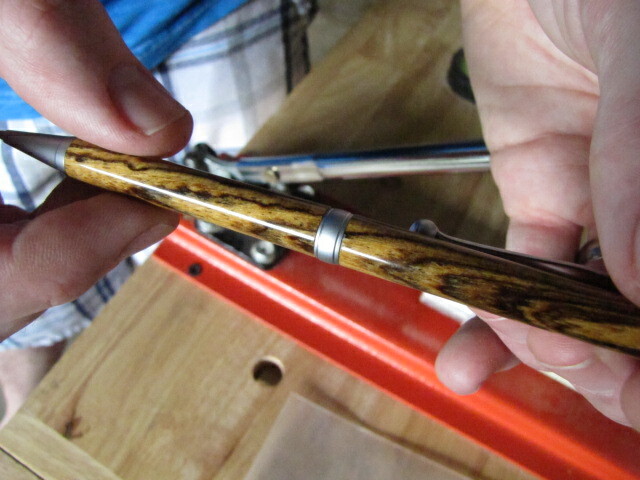 As I noted on my about me page, I started turning pens when I was 14 in seventh grade wood shop. The internet wasn’t remotely as it is today, and all of the best pen turners I would encounter at trade shows were coveting their secrets. So here are the top 5 things that I learned the hard way – a massive shortcut on your way to turning perfect pens. If you don’t own a bench grinder and a sharpening jig of some kind, you’re turning pens and other projects dramatically under your potential right now. Buy a grinder, bolt it to a table or very secure shelf, and buy or throw together a jig. We’re talking about $30-$50 and a couple of hours of work that will tremendously enhance your abilities as a wood turner. Think back to every blowout you’ve had on the lathe – odds are if you actively worked to keep your chisels sharp (sharpening them once every pen or so), 50%-75% of the blowouts you’ve experienced could have been prevented. Sharp chisels cut without any pressure added from you, which significantly lowers the odds of your pens blowing out on the lathe. Putting pressure when you’re turning = bad. Let your tools do the cutting for you. If you need some guidance on such an important topic, read my post on how to sharpen lathe tools. If you’re turning pens to sell, you’ll never get what they’re worth if you’re taking the time to make every pen as perfect as possible. When it comes to handmade items, you’ll rarely encounter a person that will pay significantly more for what they perceive to be a slightly better item. Pens are no exception. You can’t charge $50-$100 for a slimline pen that took you four hours to make when there’s a guy down the road selling the same pen, which he blasted through with significantly less attention to quality, for $20. Personally, I would never try to sell traditional pens for profit again. If you want to make a profit, you’ll either have to blast through them and care less about quality or be innovative and make your pens truly one-of-a-kind in a way that people are willing to pay for. Selling standard wood or acrylic pens for what they’re worth if you’re taking your time just isn’t going to happen on today’s market. What I mean by a true slimline pen is one that is carved all of the way down to the bushings, perfectly flush, with no bulges or curves because you didn’t want to risk blowing out or cracking the pen. In my opinion, there’s no more beautiful way to carve a slimline pen than truly clean, perfect lines all of the way across. It also shows a decent amount of skill to turn a slimline pen this way. If you have really sharp tools, you can cut them down very close to the bushings (within 1/16″ or 1/8″), but finish them off with sandpaper after that. You’ve worked too hard on that pen to end up with a gouge or groove in it. It takes longer, but you’ll dramatically minimize your risk when finishing the pen. I can’t tell you how many pens I gifted or sold after blowing them to smithereens on my lathe. I don’t know how I ever thought that was acceptable, but I’m going to attribute it to the fact that I was a little kid. On the rare occasion that a pen blows out these days, I chuck it in the trash and start over. Even if I were still selling pens, it wouldn’t be fair to my customers to sell a piece of trash like that regardless of whether or not they could spot the flaws. What if they showed it to a woodturner someday and that person told them what a piece of crap it was? What would that do to my reputation? If your pen explodes on the lathe, don’t piece it back together. Throw it away, get some spare brass tubes, and start over. It’s just not worth risking your reputation or staring at its flaws for years to come. You paid good money for that pen kit – get as much value out of it as you can. When I was a young pen turner, I tried SO many different things to get a gloss on my wood pens that wouldn’t fade. I specifically remember seeing wooden pens with a glass-like finish on them at a trade show when I was a kid, and when I asked the seller how he did it, he told me, “I could tell you, but then I’d have to kill you.” Can’t a kid catch a break?! His secret was several layers of CA glue. That’s the only way you’ll get a wooden pen to shine forever. You’re essentially layering on so much CA glue that you encapsulate the wood in a thin layer of acrylic from now until the Armageddon. I’ve even heard stories of running them through the washing machine – the ink cartridge needed replaced, but the pen still looked like it did the day it came off of the lathe! CA glue finishes are tricky, but with some practice they’re a great way to add flare to your pens. If you’ve never tried one before or are curious about the process, I show how to apply a CA finish in my pen turning tutorial. Agree? Disagree? Find Any of This Helpful? Then leave your thoughts and comments below! I’m always learning and improving, so if you have something to teach me leave it in the comments below! And if you found any of the above information helpful, drop a line below and let me know you stopped by! Your web posts are like a breath of fresh air. While I try to refrain from critiquing anyone in a negative way I will say in my experience I’ve found what I feel is a better alternative to using ca to finish pens. The products I use now are as durable and nice looking, Woodturners finish is a great product and much safer. Also use minwax polyurethane to employ the dipping method. Both can be found on the internet (I use google)Just a suggestion, you may want to try. Hey again Mike – thanks for taking the time to comment. I don’t mind the critique at all – I’m always wanting to learn more about new methods and, frankly, CA finishes can be quite a pain. The products that you’re using give a glass-like finish that will hold up for the life of the pen, even for years to come? If so, please pass along more details whenever you have the time! I’d be very interested in trying them out for myself and maybe creating a post to help others if they work very well. I have been turning pens for about 1-1/2 years. I have been a woodworker and metal worker for over 40 years. I decided to purchase a mini metal cutting lathe (Harbor Freight) rather than a wood cutting lathe. I am able to use the compound on the metal cutting lathe with carbide tipped tools to get the pen blanks round and almost to size and then us wood cutting tools. Just a suggestion to reduce the wear on your wood cutting tools. Nice post. I have been a woodworker for over 8 years. I will try to tune a pen on wood cutting lathe.